It’s hard for cities to create safe, walkable streets when engineers follow a playbook that prioritizes car speeds above all. 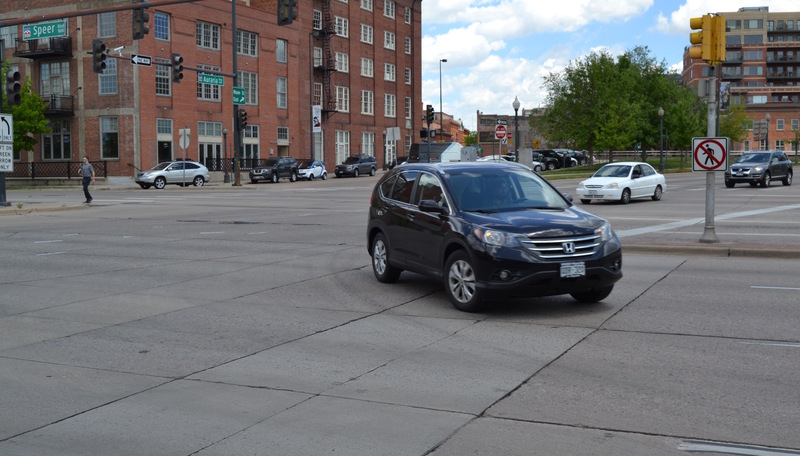 During a redesign of Federal Boulevard, for example, Denver Public Works ignored pleas for safer pedestrian crossings because the agency viewed moving traffic as the primary “purpose and need” of the road. Change the playbook, though, and changing the streets can get a lot easier. That’s the thinking behind a new internal guide for Denver Public Works and Community Planning and Development engineers, which lays out standards for designing pedestrian crossings. Until now, city engineers haven’t had any official guidance on when crossings should receive paint, signs, curb extensions, or flashing lights known as pedestrian beacons. The new guidelines should be a corrective to old-school design standards that have devastated city neighborhoods. A legacy of the 1960s, these standards led engineers to design city streets like highways, with 12-foot-wide lanes and wide turns — to the detriment of public safety. New design standards for pedestrian crossings can help reverse that legacy, at least in part. Time will tell if city engineers take advantage of the guidelines to improve the visibility of crosswalks and install curb extensions that shorten crossing distances and compel drivers to take turns at safer speeds. According to Streetsblog’s reading of the new standards, they say Denver’s urban highways are prime candidates for curb extensions — think Federal Boulevard, Colfax, and Broadway, to name a few. The pedestrian crossing guidelines are a step toward making Denver streets safer, but the Hancock administration can’t stop there if it’s serious about ending traffic deaths. The design playbook for the whole street, not just the crossings, should prioritize people’s safety. Curb extensions should be the standard and not the exception. In some places cars literally have more options for movement than people. That’s broken.